In almost each aspect of life, both professional and personal, the key to success and happiness is effective communication. Relationships cannot grow without open and honest communication, and the same is true for businesses of any size. The quality of your organization’s internal communication speaks volumes about the business itself. If poor communication is not improved, your business’s days could be numbered. 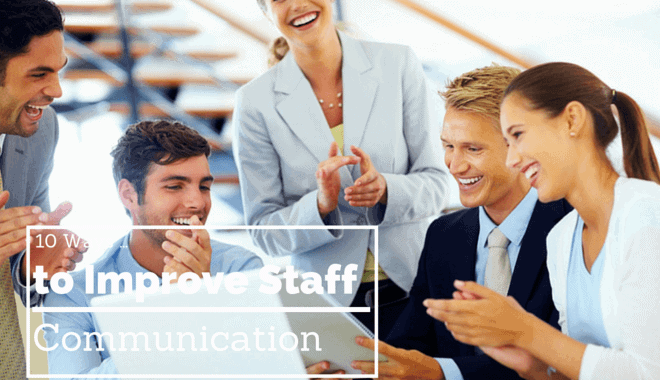 Fortunately, there are a plethora of ways in which you can improve staff communication. If you want your employees to communicate more effectively, make sure the leaders are doing it first. Have your managers lead by example. Managers should comment, share, ask questions, answer questions, and offer feedback. It is a common practice for employers to implement new policies or procedures without explaining the rationale behind it. This sows distrust and resentment among employees. Although competitive and legal reasons may prevent you from sharing all of the details, employees, when possible, should be told of the reasons behind planned changes. Not only does this help feel like a part of the team, but it can also lead to suggestions that improve the original plan. Gather input from your employees. From installing a suggestions box at the workplace to meeting with employees in small groups, this provides them with opportunity to make suggestions, ask questions, and post concerns. The results of these efforts can then be used to target your efforts and gauge the success of your efforts to improve staff communication. Many employees view company meetings as a significant waste of time when that time could be devoted to more productive tasks. You can reduce the amount of time spend in meetings by using online reporting and team update tools. One study found that organizations that made the switch to using social technologies saw interaction among their workers and productivity rise by 23% – on average. At first thought, this might seem like a juvenile thing to do, but creating your own internal language for your business will not only improve workplace communication, but also employment engagement. An internal language can range from a plethora of made up words derived from inside jokes to a specific set of monikers or acronyms that are employed to describe certain aspects of your business. It offers an interesting and humorous method of communicating throughout the week, and contributing to the development of the language fosters company culture. In the modern workforce, the majority of communication is done through email. Because employees often receive dozens, if not hundreds, of emails each day, an inbox can quickly become cluttered. To get immediate attention (if it is truly warranted), use action words, like HELP, URGENT, or ACT, in the subject line so employees can prioritize which emails necessitate immediate attention and which ones can be dealt with at a later date. Frequently working long hours is numbing and exhausting, particularly to a person’s mindset, and it is difficult to effectively communicate with one another when you are exhausted. Actively encourage your employees to step away from their desks when they need too. This might mean taking an occasional personal day or simply an extra hour at lunch. Your employees will be more productive (and you’ll see better results from them) if they know they have the opportunity to recharge when needed. Although this might sound old school, it is beneficial to create opportunities for employees to meet one another outside of the office. Nothing hinders effective communication more than when there are employees who haven’t met one another. Plan an after work happy hour or a holiday party. It gives your employees something to look forward to, in addition to improving stronger communication and engagement. It is simple to categorize employees into groups and then conduct meetings across different levels of a business, and there is a time and place for this. However, you shouldn’t neglect your middle management. They can be your best friend or your worst enemy. Pay them due respect and the influence they exercise over employees by providing them with one on one meetings or separate channels to discuss concerns and issues. Last but not least, every HR manager wants their employees’ communication to be as streamlined as possible, but what are you own communication skills like? After all, you do lead by example. Taking stock of how you approach communication can be enormously beneficial. The only way to serve as a model leader is if you work on improving yourself as well.